Now SOLD OUT! There will eventually be re-sales. Contact us if you would like to get into this fabulous community. 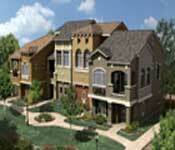 New build townhomes, all with garages! 1,086 to 1,850 sq feet, 2, 3 and 4 bedroom homes, all with no neighbors above or below. This gated community is minutes from the 101, 202, and ASU Campus, and convenient to Sky Harbor International Airport and the I-60. It is directly across the street from a golf course, and boasts 2 on-site pools. It offers 2 bed, 2 - 2 1/2 bath; 3 bed, 2 1/2 bath, and 4 bed, 3 - 3 1/2 bath homes, all with attached 1 or 2 car garages! The standard features are generous, too - tile in the kitchen and baths, security systems, structured wiring packages, full-sized washer/dryers, and more! villagio@weareazrealestate.com for more info.